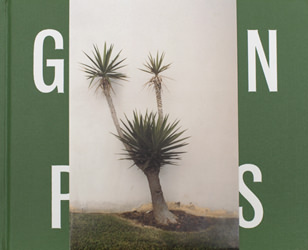 96 pages, hardcover, 10 "x 8"
Golden Palms is a collection of Ed Panars photographs of Los Angeles, where he lived for two years without a car. The cumulative effect is a subtly hilarious and beautiful walking tour through generic back streets, showing us a side of contemporary LA that most people speed by. Includes an interview with Ed and Charlotte Cotton. Photography in Chicago as part of the Midwest Photographers Project.